Agroforestry – a land management system combining crops, trees and sometimes livestock – is an integrated approach that can contribute to smallholder’s food security and capacity to adapt to climate change, while at the same time increasing biodiversity in agricultural landscapes and contributing to climate mitigation. These multiple benefits are explored in a new report “Achieving the Global Goals through Agroforestry” launched on October 1, 2018. 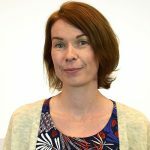 The report is a result of a collaboration between the members of the Agroforestry Network which brings together different actors, including Vi-skogen (Vi Agroforestry), Agroforestry Sverige, Focali, NIRAS, SIANI, SLU Global and SwedBio. The report builds on an extensive literature review and presents environmental, social and economic benefits of agroforestry at the farmer, community and landscape levels. Special attention has been given to the benefits of agroforestry for food security, climate change adaptation and mitigation, and biodiversity. The report highlights that agroforestry has the strongest impact potential on the Sustainable Development Goals poverty reduction (SDG 1) and zero hunger (SDG 2), as well as on climate action (SDG 13) and sustainable life on land (SDG 15). In addition, the report also discusses how agroforestry can contribute to other goals relating to increased gender equality, better health, increased access to clean water, sustainable energy solutions and responsible agricultural production. However, for agroforestry to reach its full potential, barriers need to be addressed at all levels. The report identifies several obstacles at farm level and at national policy level in developing countries, as well as at donor country level and in international institutions. At farm level, the report argues that there are few value chains developed for agroforestry products and for connecting them to consumers and the market. The slow return on investment in agroforestry is also found to be problematic, as many farmers, especially women, do not have access to capital, credit or secure tenure of their land. Further, even though agroforestry is a widespread practice in developing countries, agroforestry is rarely emphasized in countries’ development cooperation action plans, strategies and budgets. Agriculture and forestry are often compartmentalised in strategies and policies relating to development cooperation. Further, there is low visibility of these practices at the donor country level and in international institutions. increasing knowledge and cooperation among key stakeholders, including supporting more demand-driven, participatory research and knowledge exchange. To find out more you can read the full report, available on the Agroforestry Network website. 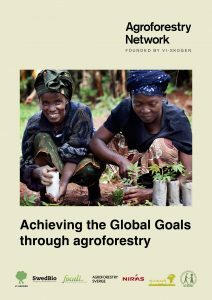 Read the full report "Achieving the Global Goals through Agroforestry"